Martin D. Hardin (1837-1923), Brigadier General, USA (IL). Participated at the Peninsula campaign, 2nd Manassas (WIA), Gettysburg, Bristoe Station (WIA & lost arm), North Anna (WIA), Washington, D.C. defenses, Early's raid. 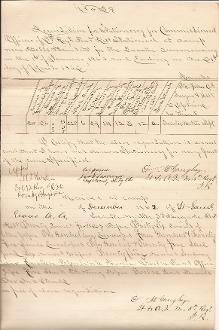 Document Signed (DS), 1 page, folio, Camp near Belle Plains, VA 12/62, requisition for stationery. Signed with rank as Col. 12 Reg. P.R.V. Comdg. Brigade. The document is also signed by J. Harvey Larrimer as Capt. Comdg. 5th Reg. P.R. (he was commissioned in Co C., 34th Pennsylvania Infantry and was killed on 2/14/64 at Bristoe Station, VA), as well as twice by David McGaughey as Lt. & Q.M. 5th Regt. P.R.